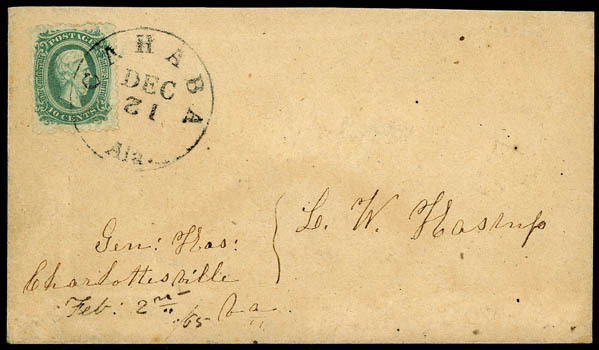 Confederacy, 1863, 10¢ blue, officially perf'd, neatly tied by "Cahaba, Ala., Dec 12" cds (day inverted) on fresh homemade cover to Charlottesville, Va., Extremely Fine, a choice example of the officially perforated 10¢ issue on cover; with 2002 C.S.A. certificate. Scott No. 11e; $900 Estimate $500 - 750. 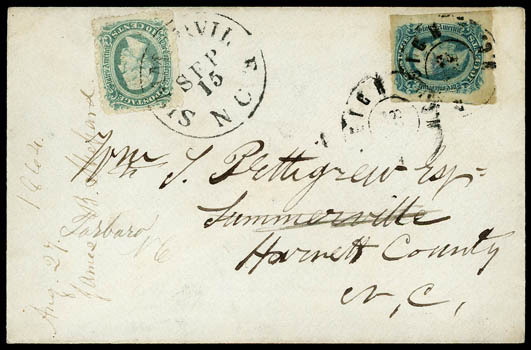 Confederacy, 1863, 10¢ blue, officially Perf'd, well centered, bright color, tied by "Summerville N.C., Sep 15" cds as forwarding postage on Pettigrew correspondence cover originally mailed with 10¢ blue (11), large to huge margins, tied by two strikes of "Raleigh N.C., Aug 28" double-circle datestamp to Summerville and forwarded to Tarboro, docketed Aug. 27th 1864 from James B. Shepard, Very Fine and rare forwarding combination. Scott No. 11e Estimate $500 - 750. 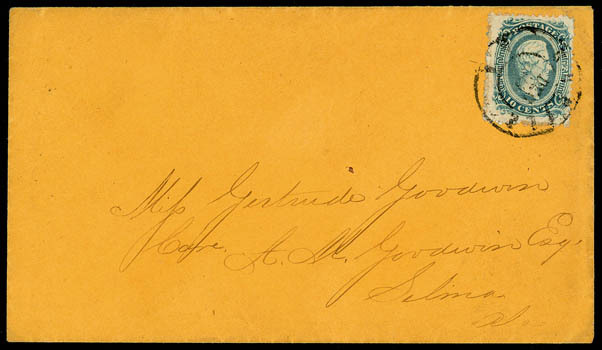 Confederacy, 1863, 10¢ blue, officially perf'd, bright color, tied by "Mobile, Ala., Dec 13" cds on fresh cover to Selma, Ala., Very Fine; with 1972 P.F. certificate. Scott No. 11e Estimate $400 - 600. 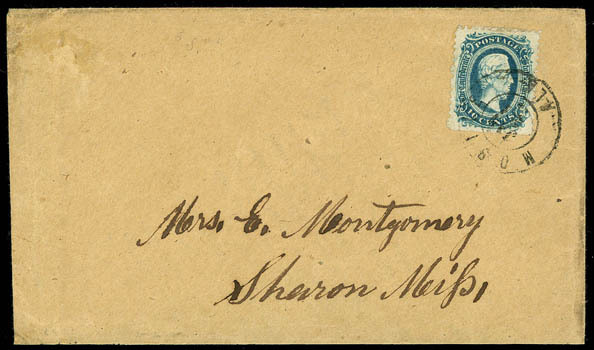 Confederacy, 1863, 10¢ blue, officially perf'd, rich color, tied by "Mobile, Ala., Jan 23" cds on adversity cover made from war restriction notice, to Sharon, Miss; missing bottomflap, Very Fine. 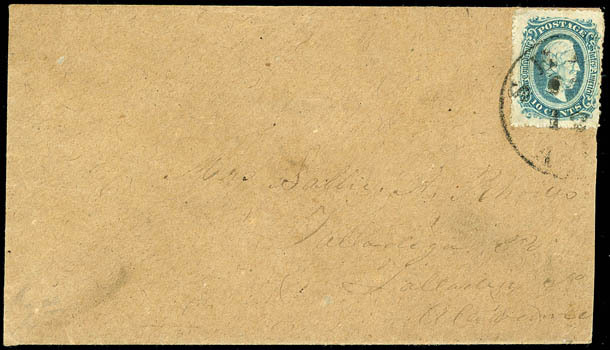 Confederacy, 1863, 10¢ blue, officially perf'd, wide margins, tied by partial "Selma, Ala., Oct 12" cds on fresh homemade cover to Talladega, Ala.; cover slightly reduced at right, Very Fine; with 2007 C.S.A. certificate. 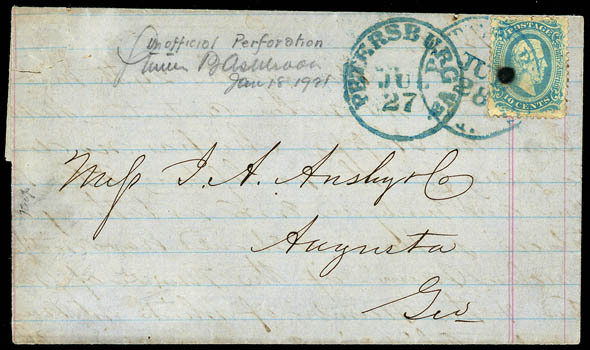 Confederacy, 1863, 10¢ blue, unofficially perf'd, tied by blue "Petersburg, Va., Jul 28" cds on 1863 folded letter to Augusta, Ga., with second strike of cds dated one day earlier; stamp with small tear and ink spot, F.-V.F., a rare unofficial perforation usage; signed S. Ashbrook as "Unofficial Perforation", with 2008 P.F. certificate. Scott No. 11e var. Estimate $400 - 600.